Not surprisingly, the Crown Colony class of light cruisers were all named after British crown colonies. The Fiji group of the class were Bermuda, Fiji, Gambia, Jamaica, Kenya, Mauritius, Nigeria, and Trinidad. The Ceylon group of the class were Ceylon, Newfoundland, and Uganda. 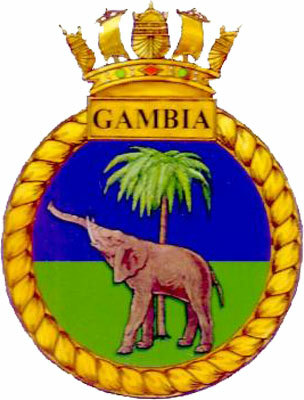 HMS Gambia's crest was based on the arms, badge or emblem of the Gambia Colony and Protectorate between 1889 and when the country gained indepenence on February 18, 1965. 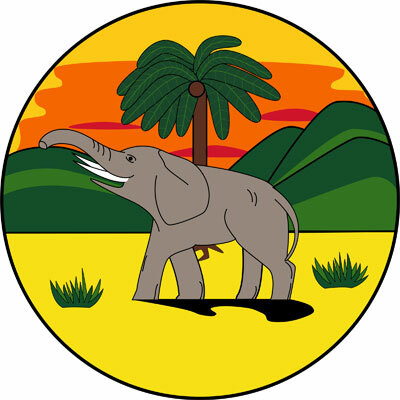 The same emblem was used by Sierra Leone, 1887 until 1914, but the country did not gain its independence until April 27, 1961; and the British Gold Coast or Ghana, 1877 to March 6, 1957. 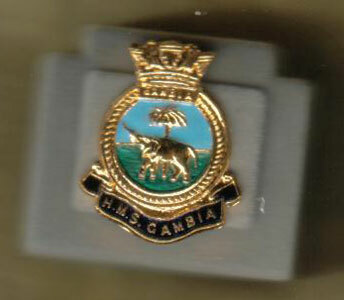 The crest for HMS Gambia was approved on March 1, 1943. There was a wartime decision that all new badges would have a circular surround. Some post war unofficial reproductions of the badge have the incorrect, pentagonal surround. 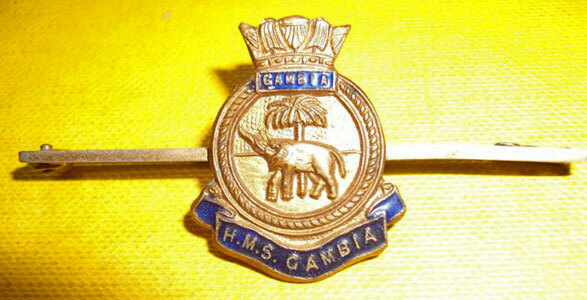 The images of the tie pin and ashtray were given to the original HMS Gambia Association website by Julian Best. "My late parents-in-law lived in Iran during 1955, since my father in law was employed by Shell and working in the Iran Refinery (Persia in 1955). At that time they met a few guys from HMS Gambia, who happened to be in Abbadan in Iran. These were George Rice and Jim Smith, both from Devon, England. 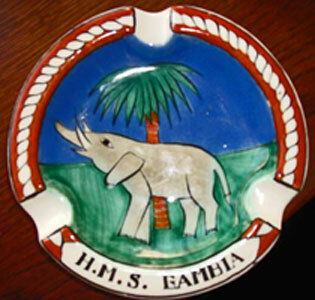 When they had to say goodbye, they gave as a gift a silver "Shopping List" cover with the HMS Gambia emplem on it - an elephant in front of palm tree. That silver cover is now in my wife's possession and I believe she has also some pictures of the two guys, mentioned above." Jim, in fact gave an address in Plymstock and George gave one from Tavistock. A picture of the cover of the shopping list was also kindly supplied by Will. 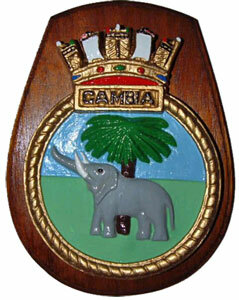 Ships' badges first appeared in the 1850s, as identification markings on the stationery used by some Royal Navy ships. These marks were quickly used to mark the boats assigned to a ship, to aid crew in finding their boat at a dark or crowded wharf. The creation of badges was haphazard, and eventually came into use for the ships themselves. In 1918, Charles ffoulkes, the curator of the newly established Imperial War Museum was asked by the commanding officer of HMS Tower to design a badge for his ship. He quickly received requests to create badges for other Royal Navy vessels, and on 10 December 1918, ffoulkes was appointed the Admiralty advisor on heraldry. 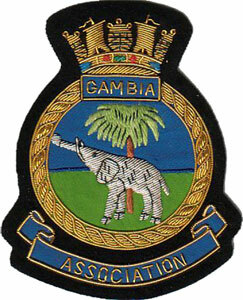 Shortly prior to this, a Ships' Badge Committee had been established to regulate the creation and use of ships' badges. Testing was carried out to ensure that the badges were designed appropriately to identify ships. Cardboard mockups were created, gilded, and installed on a police launch, which was observed on patrol of the Thames by a captured German submarine moored outside Westminster Palace. It was decided to use different shapes to identify different types of vessel: circles for battleships, pentagons for cruisers, 'U'-shaped shields for destroyers, and diamonds for auxiliary units, including depot ships, small war vessels, and aircraft carriers. In 1940, the designs for all ships were standardised to a circular design. 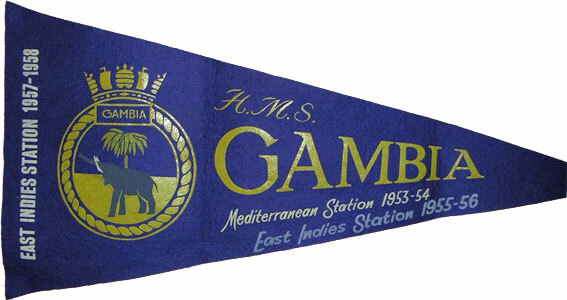 This was primarily due to wartime shortages, although another factor was to eliminate difficulties caused when a ship was commissioned with a previously-used name but was a different type of vessel, requiring the badge to be redesigned for the new shape. At the same time, the use of scaled-down badges for a ship's boats was suspended, and as of 2000 has not been resumed. After the war, the pentagonal badge shape was assigned to Royal Fleet Auxiliary vessels, and the diamond to commissioned shore bases. 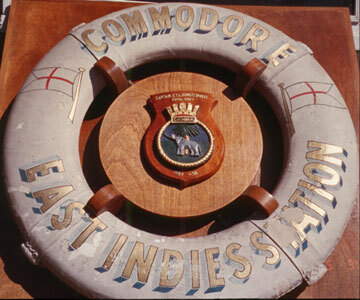 Before World War II, the design of badges for ships in other Commonwealth navies was the responsibility of the Royal Navy Ships' Badge Committee, but this responsibility was assigned to the relevant nations after the war. 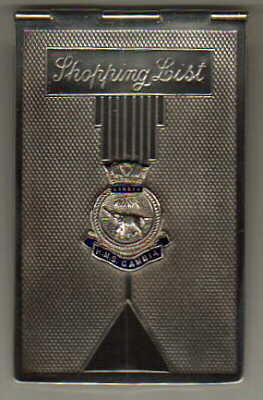 Ships' badges are reused along with the ship name. 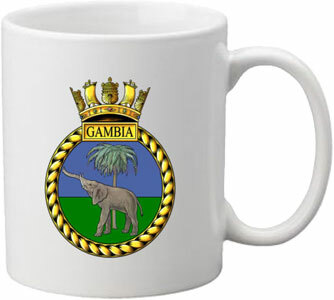 When the Queen approves the name of a new ship she will also approve the new ship's badge, which may have changed if the shape needs to change. Diamond Shaped for Aircraft Carriers, Depot Ships, Submarines, Sloops and Auxillary Ships.